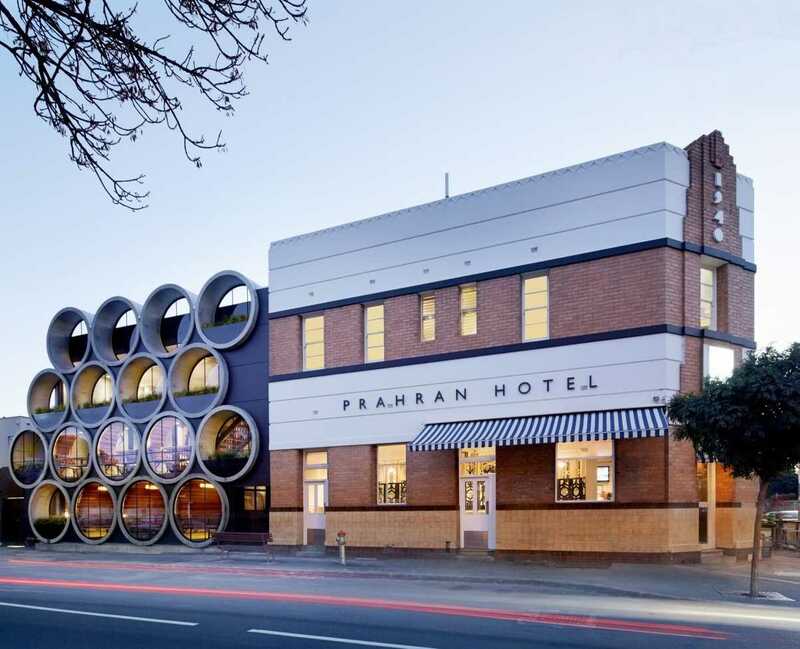 The Prahran Hotel is in the heart of Prahran, in Melbourne. The inner city 1940’s pub transformed a very small 1970’s add-on rear extension into a clever architectural statement by Justin Northrop, project designer at Techné Architecture & Interior Design. The re-development of the space has effectively converted the 130m2 back area of the hotel into 300m2 over three levels. The design centres on a series of seventeen custom made concrete water pipes which are intended to emulate stacked beer barrels. The pipes measure 2.25m in diameter and vary from 2.5 tonnes to 7.4 tonnes each and overall there is approx fourty metres of pipe involved. Each booth in a pipe seats up to twelve and features leather upholstered banquettes and linings of recycled spotted gum slats and acoustic absorption mats. The hotel is owned and operated by the Sand Hill Road Hospitality Group which also has the Bridge Hotel, Richmond Club Hotel, Holliava and the Post Office Bar Pizza in their hotel group. Sand Hill Road co-owner Matt Mullins described the circular concrete motifs as being largely inspired by the establishment’s original art deco design.